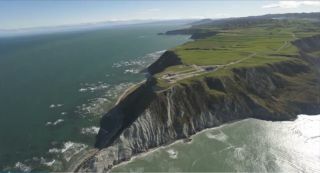 An aerial view of the Rocket Lab launch complex in New Zealand. On a remote peninsula in New Zealand, construction has been completed what appears to be the world's first private launch complex for orbital space flights. The Los Angeles-based commercial spaceflight company Rocket Lab announced the completion of Launch Complex 1 today (Sept. 26 EDT, Sept. 27 local time in New Zealand). The company plans to use the facility to launch its Electron rocket, which is designed to carry small satellites and other small payloads. Air traffic near the launch complex site is fairly sparse, which the company says will allow it to achieve the "highest frequency of launches in history," according to a statement from the company obtained by Space.com. Peter Beck, Rocket Lab's CEO, told Space.com in an interview that the complex is licensed to conduct a launch as frequently as every 72 hours. However, the company expects to carry out a launch about four to five times per month, he said. Rocket Lab CEO Peter Beck poses with The Rutherford rocket engine at the company's Auckland, New Zealand headquarters on June 10, 2015. The statement from Rocket Lab declared its new facility "the world’s first private orbital launch complex." The private spaceflight company Blue Origin operates a private launch facility in Texas, but has only used that facility for suborbital flights. The private spaceflight company SpaceX has not yet completed construction on its private orbital launch facility in Texas. Rocket Lab's main objective is to enable more affordable and more frequent access to space, particularly for small satellite payloads, Beck told Space.com in an interview in August. To that end, the company chose to build its own launch complex in New Zealand, which gives the company exclusive launch access. Construction on the launch complex began in December 2015, the statement said. The company plans to charge NZ$7.6 million per flight (about $5.5 million). The Electron rocket, equipped with the company's Rutherford engine, can carry payloads of up to 330 lbs. (150 kg) into sun-synchronous orbits (so the satellite flies over a point on the Earth at the same time every day). Traditionally, most small satellites have piggybacked on rockets carrying much larger payloads; the small size of the payload faring means those satellites will be launched alone. Rocket Lab Launch Site Nears Completion Ahead of Test Launches from Rocket Lab on Vimeo. With the completion of the launch complex, the company says it plans to start test launches of the Electron this year. Rocket Lab currently has contracts to fly payloads for NASA as well as the private companies Planet Labs and Moon Express. Planet Labs uses small satellites to image the surface of the Earth in high definition; Moon Express, a competitor in the Lunar X Prize, will use the Electron rocket to fly its lunar rover to the moon's surface. "Completing Launch Complex 1 is a significant milestone in the buildup to our first Electron test flight," Beck said in the statement. "It's wonderful to celebrate the completion of the site with those who have helped us get this far and welcomed us into their community. Launch Complex 1 presents a considerable opportunity to change how we access space."